Sharing a paint-covered leather chair with Wubby, her 15-year-old Pekingese, artist Erika Bushee rummages through a pile of broken slate on her work table. sizes and colors. Erika repeats this task over and over until the bowls are full. Her business is named Art Rocks Studio, inspired by her use of river rock from Colorado along with the slate and occasional gemstones. She also sleuths out driftwood for special projects. 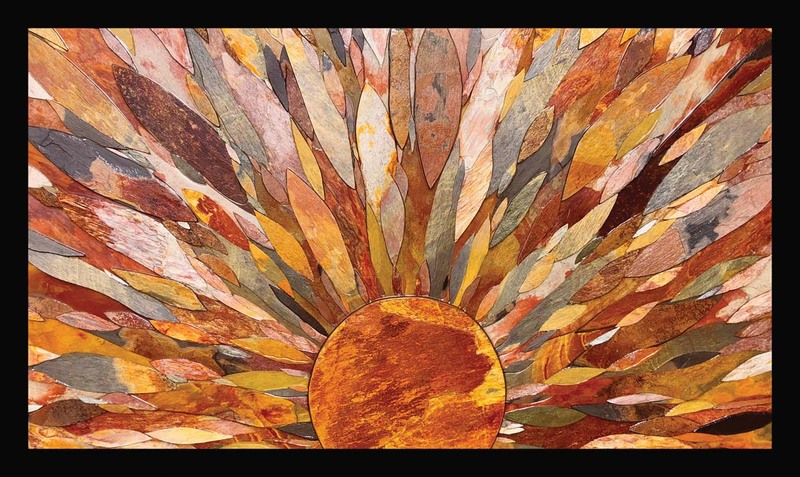 “In Colorado, no one wants to go hiking with me because they know I’ll make them carry wood and rocks.” In February, she traveled to the Tucson Gem and Mineral Show, one of the largest in the world, to find a few treasures to take home. 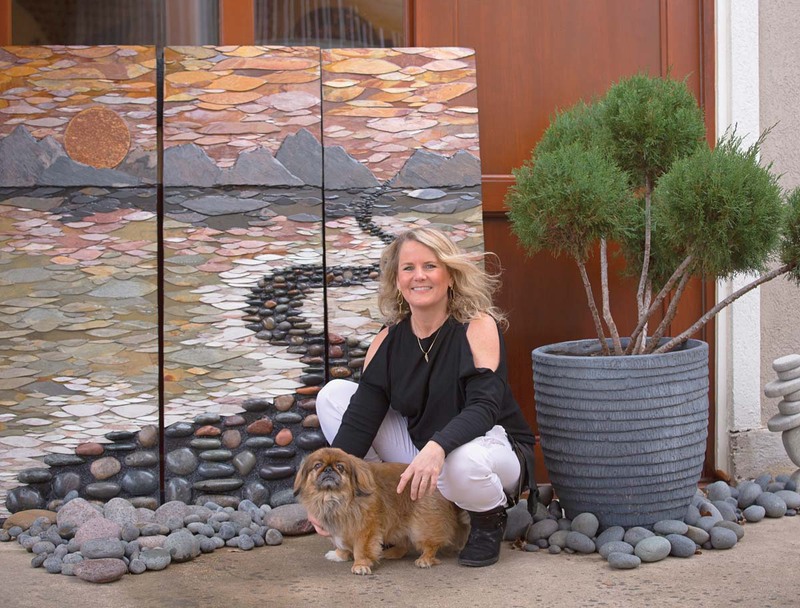 Flower Mound artist Erika Bushee with Wubby, her 15-year-old Peke, and one of her signature slate-and-river-rock art pieces, River runs thru it. 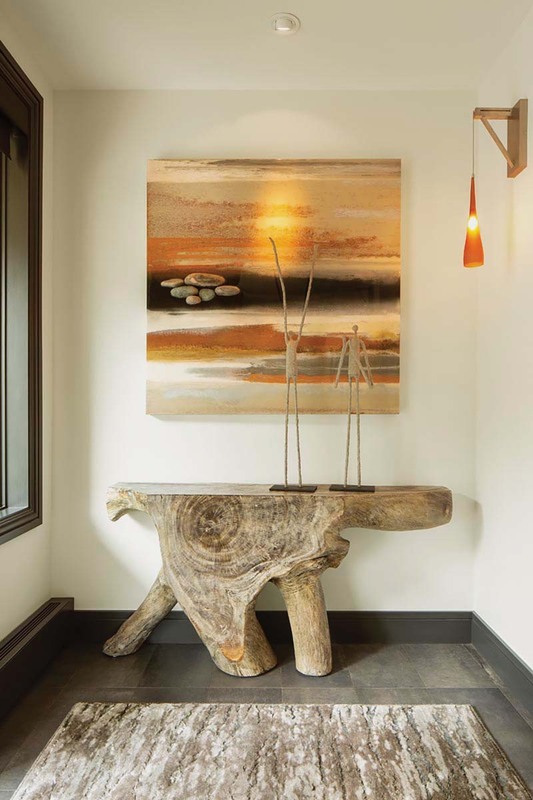 Rainbow river complements the earthy decor in this home. Erika has been busy this winter getting ready for Southlake’s Art in the Square, which is April 26-28. A featured artist for this 20th year of the festival, Erika was first selected for the juried exhibition in 2002. Her mother, Arlene Voelker, who lives in Plano and also is an artist, has been part of the show five times. While Erika always sells well in Colorado, where she lives part of the year, she has cultivated an appreciative audience in North Texas. Most days find her in the Flower Mound studio in the back of her home on the northern edge of Grapevine Lake. Filled with raw materials and works in progress, the shop has been made cozy with a television and a dog bed for Wubby. A power saw sits at the ready outside the back door. In the driveway, Erika’s trusty Sprinter van is full of wrapped pieces ready for delivery. Using a chisel, she breaks down each tile into thin layers, which are used to create the feather shapes. Bigger pieces of tiles are cut and chiseled to give the edges a more free-form and natural look. Then there are the piles of river rock, scattered in and around the studio. She splits the smooth stones, making them easier to attach to the base board. 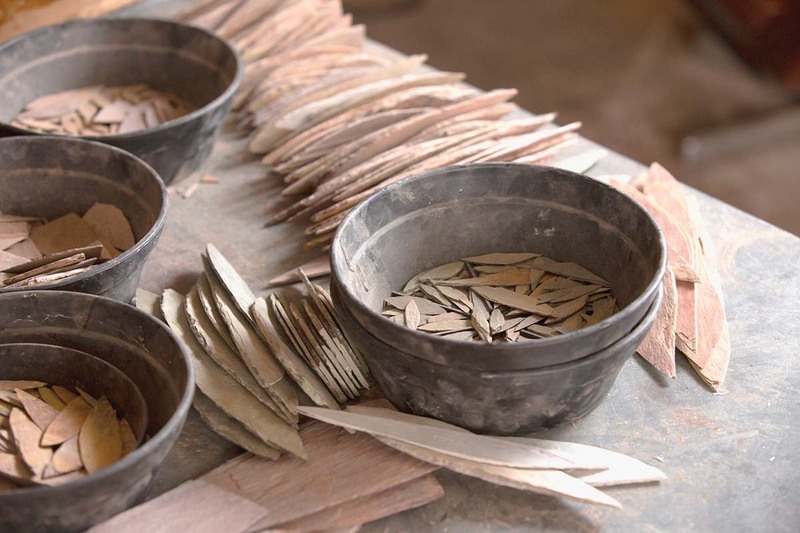 Shaped slate is laid out by size and color on her studio’s worktable. Below, a mosaic in progress also features metal trays and a trio of inlaid pieces of chrysocolla, a bluish-green mineral. Erika Bushee See samples of her work and learn more at artrocksstudio.net. Art in the Square Just as Southlake Town Square celebrates 20 years this April, so does this annual event. A fundraiser for the Southlake Women’s Club, the three-day festival draws a big crowd and is family friendly. April 26-28; artinthesquare.com. Art This juried show draws national, regional and local artisans, from jewelry makers to painters to sculptors. Check out the 165 participants — selected from more than 700 applicants — booth locations and samples of their work online. The Youth Art tent offers young talent a chance to exhibit and sell their work. Works by featured artists, who have exhibited multiple times, are on display now at Southlake Town Hall. Stop by and vote for your favorite. Entertainment Enjoy everything from a Prince tribute band to classic country on the Main Stage. Check out local talent and family-oriented fare on the Gazebo Stage. The give back Money raised at the event goes to grants to support 32 nonprofits.